your home with these Grazing Giraffe Bookends. Giraffes love to browse among the leaves of the acacia trees on the savannas of Africa so this giraffe comes with its own little thorny acacia. 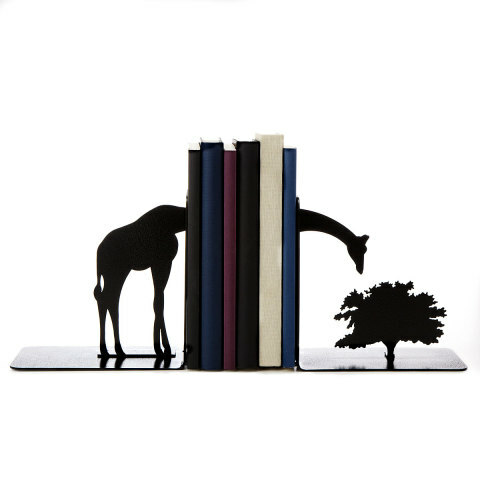 This display shows giraffe and tree in silhouette and becomes more whimsical the more books you place between them, making the giraffe's neck longer and longer. The bookends are made of sturdy carbon steel and painted with automotive paint for long wear and easy maintenance. Just dust as usual or wipe with a damp cloth. To order your own Grazing Giraffe Bookends, click here.